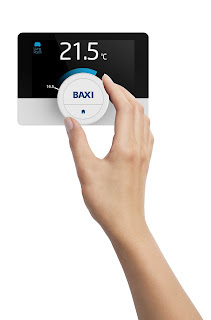 Huge savings can be made on household bills by ensuring you’re using the right heating controls within the home, writes UK boiler manufacturer Baxi’s Jon Phillips.With energy prices on the rise*, homeowners are often on the hunt for ways to reduce the cost of heating their property. One relatively easy way of achieving this is to fit suitable heating controls to ensure that you’re not over or under heating your home, or running your boiler when you have no need for heating or hot water, such as while you’re at work. If used correctly, and with an energy-efficient boiler such as one of the Baxi EcoBlue range, you should find that you’re never compromising between a warm home and a healthy bank balance again. For homes in any of those brackets, the potential savings could be huge. According to the Energy Saving Trust, simply fitting a basic room thermostat and thermostatic radiator valves, and then using them correctly, could save the average owner of a three-bedroom, semi-detached house up to £165 per year. In addition, the same household could reduce their carbon dioxide footprint by 680kg per year by simply installing controls - enough to drive a typical family car more than 1,000 miles. On average, controls should be replaced every 12 years due to advancements in technology, as well as to ensure accuracy. Now is a great time to be in the market as recent innovations allow you to remain in control of your home to a far greater extent than ever before. Many homeowners are switching from the traditional thermostat to their smart counterparts, such as the Nest Learning Thermostat. This device logs how warm you like your home to be at certain times of the day by learning from your behaviour, and adjusts the temperature accordingly – you can even access it through a nifty app on your smartphone or tablet. You can also save money by investigating in additions such as zone control, which allows you to heat different parts of your home to suit your comfort requirements, by operating them on separate heating circuits with their own thermostats. With all the technology now available at your fingertips, the right heating controls can make a big difference to your comfort and lifestyle – and your wallet. So fit the right controls and use them correctly, and you could soon be feeling the benefits. To search for a quality heating installer in your local area, simply visit the APHC website at http://www.aphc.co.uk/find_an_installer.asp.